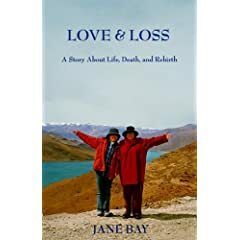 Love & Loss: A Story About Life, Death, and Rebirth is a deeply personal account of author Jane Bay’s grief and gradual healing after the death of her Tibetan daughter. While difficult to talk about her daughter’s death immediately afterwards, Bay was able to write about her experiences. “It created a safe place, a sanctuary, a container to hold the pain.” With courage and candor, she shares the overwhelming emotions of grief: shock, anger, confusion, sadness, and deep pain. Written as an “email diary,” Love & Loss incorporates the author’s communications with her daughter, Namgyal Youdon, until her untimely death; email exchanges with friends for two years afterwards; and a skillful weaving of narratives throughout that expands on her experiences. From the very first email Bay sends about Namgyal’s death and for each one thereafter, she receives an outpouring of love and support from her friends. Each offers expressions of sorrow, sympathy, and comfort — sometimes sharing their own loss and grief. Sprinkled throughout these communications are quotes from spiritual teachings, poems, song lyrics, prayer rituals, and meditations — some come from Bay, some are offered by friends. Each is an offering of love to help her heal. That is the real gift of this book: the message that others can help us heal and our healing can help others. By providing an authentic look at grief and an honest approach to healing, Bay offers hope. “There is life after death, not just for the person who has died, but for the loved ones left behind who must go on living, and hopefully living in the moment with a greater sense of joy.” Unique and poignant, this is an important book for everyone coping with loss or helping someone else cope with loss. Donna Baker Church is a freelance writer and editor. Donna may be reached at awordchick@yahoo.com . Jane Bay lives in Marin County, California where she has worked at Lucasfilm for nearly three decades. She considers herself a Sunday writer and doesn’t intend to quit her day job. She is currently working on two other books, a memoir entitled Growing Up Southern, and an anthology of short stories called The Magic of New Mexico about her experiences on the Navajo and Hopi reservations, and the Pueblos along the Rio Grande River. She is also active in the campaign to save Tibet.